I enjoy checking out all kinds of children's books, and it is fun to have a seasonal book to read. 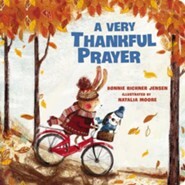 A Very Thankful Prayer is something that would be a great gift for children around Thanksgiving time. The pictures in this book are cute, colorful, and fun to look at. This is good for babies and toddlers, but older children may like it, too. I like the size and shape of this book. I like the small "extra' details like the foiled letters and leaves on the front. I like that this book is colorful and has cute illustrations. The "story" of this book is simple and thankful and cute. There is nothing in particular that I did not like about this book. Overall, I think this is a perfect book for Thanksgiving time. I give A Very Thankful Prayer 5 out of 5 stars.